Comedy film "Night School" is reviewed by a lantern staff writer. 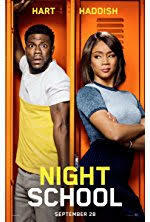 School isn’t the first thing you think of when you hear a knee-slapping comedy, but after seeing the movie, Night School, it is. This mixture of Tiffany Haddish (Carrie) and Kevin Hart’s (Teddy Walker) acting literally just existing makes this movie a stand out for me. The fun and likable characters really draw you in. The story is about a man named Teddy Walker who dropped out of high school because it was too hard. Later in life, he gets a nice job selling grills and is about to inherit the business from a man who had a son, but needed a better one. Everything would have been great if only he hadn’t accidentally blown it up by opening a propane tank which made a spark while plugging in a fan. Jobless, he is now forced to finally get his GED at night school. While at night school he meets a lot of new friends and Luis (Al Madrigal), the man he got fired by putting his hair in the food to get out of paying the bill. Along the way, this ragtag group of high school dropouts finds themselves in a situation of almost being kicked out night school for stealing the answers to a quiz, but in the end, the story is about trying your best no matter how many times it takes. Before seeing the movie, I had no idea what it was about, but I was pleasantly surprised nonetheless. However looking back on it, I’ve realized it fell short. The first thing they could have done was give the character Luis a redemption or given him a reason for redemption. The way they handled his character was sloppy. He had so much potential to be a great rival but ended up failing and becoming forgetful, much like other characters in this movie. I felt like the acting was great, but they could have so gone farther with the script writing. The last complaint I have is that there was not enough conflict and drama. Of course, there was some, but not enough. For example, his love interest just hears the speech he gives at the end of the movie and they get back together. I was thinking she would make him earn it, and it seems kind of lazy for the writers to just put them back together at the very end. One of the interesting thing about seeing the movie with my friends was getting to hear their opinions. For example, my good friend Grace Yarbrough said, “It was very interesting. Kevin Hart fit the part really well and I can relate to not understanding anything.” However, my other friend, Josie Ramler, stated “ I thought it was funny, but I don’t think it stood out in any special way. It seemed very basic and exactly what I would expect from a Kevin Hart movie. It had a few big laughs and a steady plot, but I wouldn’t go out of my way to see it.” Besides people’s negative opinions, I think it is a decent movie and a solid choice for something fun to do with friends.